Category 3 Hurricane Bud Threatens Mexico, Southwest U.S.
Hurricane Bud, now swirling off the west coast of Mexico as a Category 3 storm, is forecast to bring heavy rain to Mexico and possibly the Southwest U.S. over the next few days. While rainfall from Bud or its remnants would be beneficial to the drought-stricken Southwest, it could also cause flash floods if too much falls too quickly, according to AccuWeather. The worst drought in the U.S. is in the Southwest, with the most severe conditions in Arizona, New Mexico, Utah and Colorado. As of 11 a.m. ET, Bud had winds of 120 mph and was moving to the northwest at 7 mph. It was located about 475 miles south-southeast of the southern tip of the Baja peninsula in Mexico, the National Hurricane Center said. A tropical storm watch remained in effect for portions of Mexico’s west coast from Manzanillo to Cabo Corrientes. Rainfall amounts of 4-8 inches are expected with local amounts up to 12 inches through Wednesday, AccuWeather said. Small rivers and streams may quickly rise out of their banks and turn into deadly torrents. 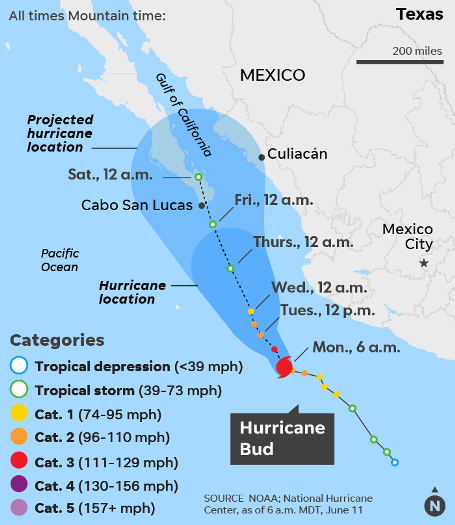 Bud is the second hurricane of the eastern Pacific hurricane season, following Aletta, which is rapidly weakening far out in the open ocean. This is unusually early for two hurricanes to have formed, as the average date for the second hurricane to form in the eastern Pacific is July 14, Colorado State University meteorologist Phil Klotzbach said. The eastern Pacific hurricane season is forecast to be quite active, thanks in part to a developing El Niño. NOAA predicts that seven to 12 hurricanes will form. El Niño could also put a damper on the Atlantic hurricane season. In the Atlantic basin, the hurricane center said that no tropical storms or hurricanes are forecast to develop in the next five days. However, a non-tropical system could form in the Gulf of Mexico. From Friday into the weekend, the risk of heavy rainfall, rough surf and gusty thunderstorms will increase from the northeastern coast of Mexico to coastal Texas and southwestern Louisiana, AccuWeather warned. The next storm that forms in the Atlantic, the Gulf of Mexico, or the Caribbean Sea will be given the name Beryl.